So we’ve mentioned a few times that Sara and I have been traveling a lot for some speaking engagements. Well, maybe not a lot a lot, compared to how some people travel, but a weekend a month is a lot for a girl for whom a big weekend is a trip to Lowe’s and Sam’s Club. Our most recent trip was to Orlando and, miraculously, I didn’t have to fly out of our teeny tiny airport at 6:00 in the morning, which is usually when I find myself there. However, that did mean that I didn’t get to Orlando until late (well, late by pregnant mother of 2 1/2 children/rural Louisiana standards). I dined in the Atlanta airport during my layover, and by “dined,” I mean, well, picked at weird airport food. By the time I got to my hotel in Orlando and met up with Sara, I was ready to eat, even if it meant eating a second dinner. Saying that kind of makes me feel like a hobbit. Sara and I crossed the street to this cool outdoor mall, in search of places to eat. We scaled a flight of unnaturally steep stairs, intending to eat at the Greek restaurant at the top of the stairs, until we discovered that it was a Greek restaurant with table-top belly dancers, which, while very exciting, was a little more zaniness than I was prepared for at a time when I am normally in my sweat pants with a dog sleeping on my feet, contemplating if it’s a socially acceptable time to go to bed. So we headed to Maggiano’s instead for our hobbit dinner. Well, my hobbit dinner–Sara only eats one dinner. At least as far as I know. We ordered appetizers and salads and chatted and it was such a great way to unwind after a long day. And, shockingly, my salad was so much better than my prepackaged sandwich and grainy apple from the airport. 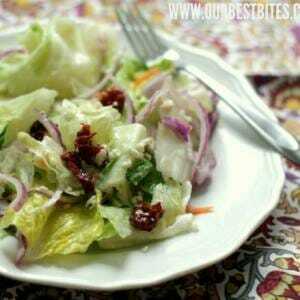 When I got home, I tried to find a recipe for the salad that I’d eaten, and while I couldn’t find that particular salad, I found a recipe for their house salad. And I made it. And loved it. So I want you guys to love it, too. It’s a very simple little side salad, no bells and whistles. Just a handful of good ingredients. For the dressing, you’ll need olive oil (light or pure for a milder flavor, extra-virgin if you want something a little more robust), red wine vinegar, sugar, water, oregano, salt, pepper, water, garlic, and Dijon mustard. And for the salad, you’ll need iceberg lettuce, romaine lettuce, Gorgonzola cheese, thinly sliced red onion, and some thin slices prosciutto. You’ll want to make the dressing first so the flavors can mingle while you’re putting everything else together. 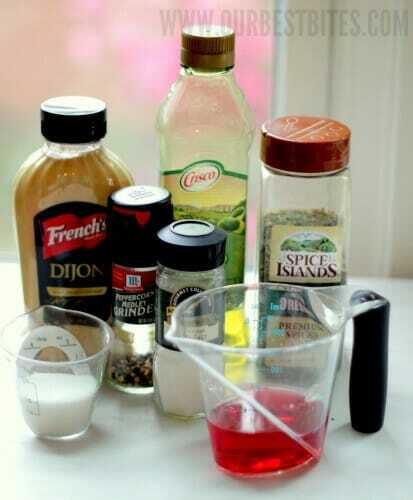 In the jar of your blender, combine all the dressing ingredients except for the oil and oregano. Blend until well-combined, then, with the blender running, add the oil in a steady stream. Turn off the blender, add the oregano, and pulse 2-3 times to incorporate and set the dressing aside. and chop it into 1-2″ pieces. If you can. It’s actually kind of a pain to cut. When the oil is hot, add the prosciutto and cook until browned and crispy. Remove with a slotted spoon and drain on a paper towel. Set it aside. add the cooked prosciutto, and toss lightly with the dressing until combined. Serve with additional dressing on the side to taste (you most likely will not end up using all the dressing, so save it for a rainy day). 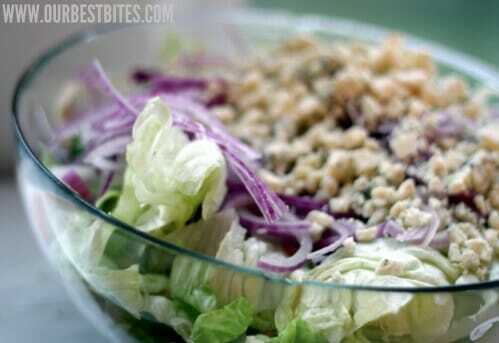 This salad makes 10-12 side salad servings. A handful of simple and delicious ingredients makes this great side salad, good to pair with just about anything. To prepare the dressing, combine all the ingredients except for the oil and oregano in the jar of a blender. Blend until smooth, then, with the blender running, add the oil in a steady stream. Turn off the blender, add the oregano, and pulse 2-3 times or until combined. Set aside. Heat the vegetable oil in a large skillet over medium-high heat. When hot, add the prosciutto and cook until brown and crispy. 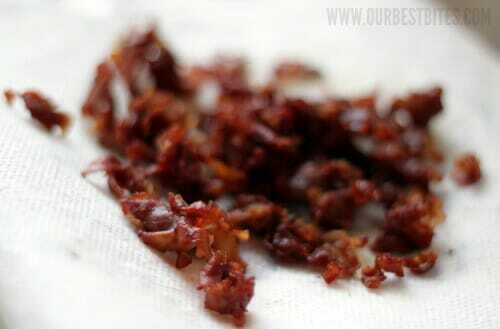 Remove with a slotted spoon and drain on a paper towel. Set aside. 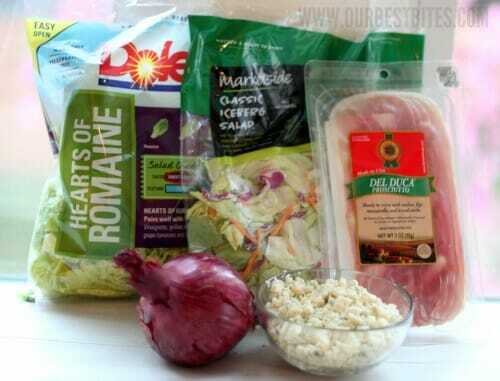 In a large bowl, toss the lettuce, cheese, onions, and crispy prosciutto. Lightly drizzle some of the dressing on the salad and toss until combined. Serve immediately with additional dressing on the side, refrigerating any dressing leftovers. In a large bowl, toss the lettuce, cheese, onions, and crispy prosciutto. Lightly drizzle some of the dressing on the salad and toss until combined. Serve immediately with additional dressing on the side, refrigerating any dressing leftovers. Serves 10-12. P.S. If you haven’t entered our candy giveaway, be sure to head over HERE and tell us about your favorite old-school candy! This salad looks so good that I could honestly eat it right now…for breakfast. This salad looks yummy! Can’t wait to try it. Looks delicious and I am always looking for a nice new side salad. 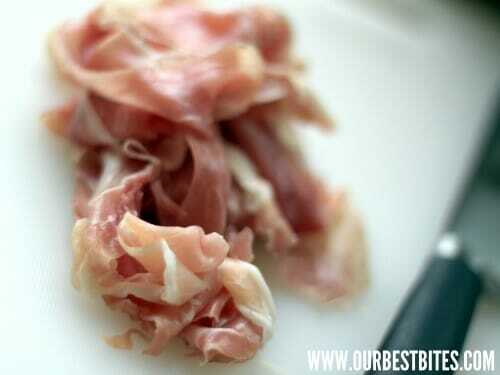 How does cooked prosciutto compare to cooked bacon? I love the old Peanut Chews. Hard to find. But love them. Love love Maggiano’s salads! Hmm think I might add this to our steak dinner for the weekend! I already have an admitted mom/blogger/cook crush on you and then you go and throw in a LoTR reference? *swoon* LOL! As for the salad sounds delish and simple enough! So excited for you guys to fly here for ToFW!! Prociutto is MUCH easier to cut if you use scissors! I hope that’s not the only thing you ate there. Maggiano’s is one of my favorite restaurants! When I think of amazing comfort food, I think of Maggiano’s baked ziti or anything parmigiana or linguini with clams.. Mmmmm! No, definitely not!! 🙂 But the salad stood out to me, I think because I’d been eating yucky, stale food all day. 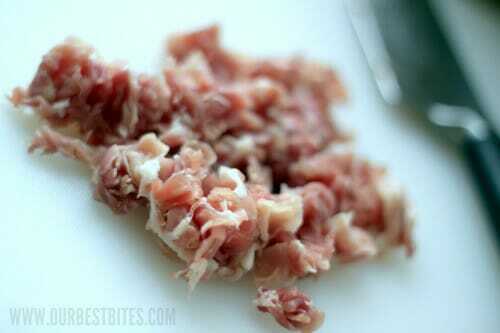 It might be a little bit easier to cut the prosciutto if you pop it in the freezer for a few, works with bacon! Really? That much oil to cook the prosciutto? I think the oil is for the dressing, You probably only need a tiny bit too cook the prosciutto, if any at all. Okay I just noticed the half cup for the prosciutto – that seems excessive to me, too, but what do I know?!? The recipe I adapted from wants you to use 1″ of oil in a skillet. Like I said below, it’s not necessary, it just helps make it crispier. LOVE this salad from Maggiano’s!! Thank you ladies! This looks so yummy! Thank you! I like to use kitchen shears for cutting up bacon and prosciutto, it’s so much easier than trying to chop it with a knife. It was so fabulous to see you lovely ladies in Orlando! You 2 seriously inspire me to keep at it even when my kids are stressing me out! I can’t wait to try this! My husband and I LOVE the Maggiano’s house salad and always order it when we go. Yum! I’m a regular diner at Maggiano’s, my family even had Thanskgiving dinner there this past holiday and it was INCREDIBLE. They do a fantastic Thanksgiving dinner…. 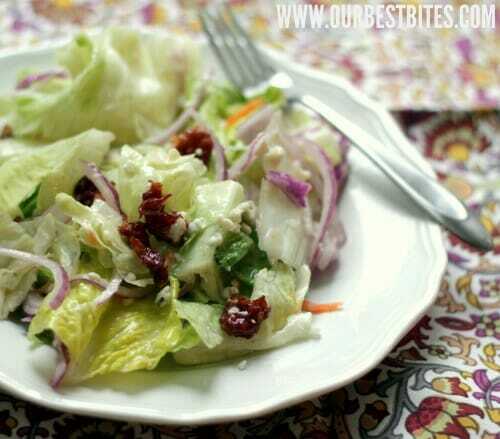 Their house salad is my absolute favorite, it’s so good, so lite and just simply scrumptious! Thanks for making me laugh with your hobbit comments as I am a certified grump right now. Wish TOFW was in St. George again this year! I’d love to hear you guys speak! I get obsessed with new and simple salads. I think this might be my new obsession to replace my old obsession which was romaine, sliced apples, feta and poppy dressing. After having this salad basically night for a year, we’re kinda over it. Ready to move on. Thanks for the new idea! An easier way to crisp prosciutto is to bake it in the oven until it is crispy- just a single layer on a baking sheet with the slices whole and then once it cools it crumbles really easily (that’s how Giada does it and it works perfectly). I made this last night for dinner and it was wonderful!!!!!! Thanks for the recipe! This salad sure caught my husband’s eye,and mine. Looks wonderful. But prosciutto is ham; pancetta is bacon. Both are good, so it’s hard to go wrong! Thank you for sharing this amazingly delicious recipe with us! I will be raving about it and putting your link on my site! LOL! I had a good laugh because I just moved to Virginia from Orlando and know that Greek restaurant very well (OPA!). For the record, they have AMAZING greek food if you can fend off all the paper napkins flying around. Your salad sounds wonderful; I can’t wait to try it! Wow! This looks so delish! I made this salad for a family event and everyone raved about it. I love your recipe ideas and so does my family! I made this for an event at church last night. I heard rave reviews! Of course it was gobbled up so quickly, I didn’t get a taste. Just made this for my “gourmet club” and it was a hit. Thanks so much! Is there a brand of red wine vinegar that you prefer? I seem to always pick the wrong one LOL. Looking forward to trying your recipe! I laughed out loud when I read your comment about your “hobbit dinner.” Actually I laughed twice, because I re read it and it was more funny the second time. I can totally relate 🙂 This salad sounds so good, especially with the crispy prosciutto!